There’s nothing more quintessential than a Corn Maze in the fall! 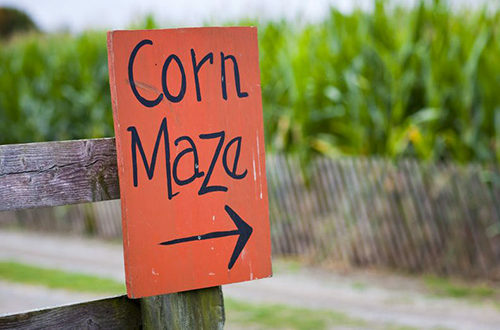 Here is your guide to local corn mazes. Check ahead before going to any of the mazes for updated hours and conditions. Did you know? They have an incredible snack shack and picnic tables to enjoy after the maze. Did you know? They have a haunted corn maze event in October. Mini Corn Maze for Younger children. Take the big slide into the maze and then find your way out! Did you know? They have a pumpkin festival every weekend in October with Free Admission. The Wizard of Oz Maze is open 7 days a week. Cost: $12pp weekends and holidays, $10pp Mon-Fri. Children 3 and under are free. Offering one of the smaller local mazes great for younger kids. Cost: Admission is only $3 and takes about 15 minutes to complete. Did you know? Brookfield Orchards is Celebrating 100 Years this year! See our website for full details! The 5 Acre Maze opens Friday nights and weekends beginning 9/22. Did you know? Admission includes pedal carts, cow train, wagon rides, barnyard jump (must be 36 ‘) and much more! Mini golf and pony rides at a discounted rate. Check out our calendar for special events at these locations! Previous PostThis book got my kids to eat tomatoes! Great books for life lessons. Next PostFind an orchard near you with the 2018 WCKC’s Fall Apple Picking Guide!